Coach Mark Richt confirmed that quarterback Jack Allison’s shoulder injury was only a bruise after Tuesday’s practice at the Greentree Practice Fields. However, Allison does have a concussion. Saturday’s full-contact scrimmage provided a unique opportunity for the coaching staff to see all of the quarterbacks live in the pocket and under duress against defensive pressure – an opportunity that Richt said was much needed. “I made the decision [to let the quarterbacks get hit]because I really couldn’t find any clarity on who was separating themselves from the pack,” Richt said. However, that decision came with a price. Allison, a redshirt freshman competing to be the University of Miami’s starting quarterback in the fall, sustained injuries to his AC joint and head. Richt said he would absolutely make the same decision if given the opportunity to do it over again, emphasizing his intentions to create a realistic environment. Regardless of the quarterback situation, a strong running-back core is expected to lessen the burden on whoever takes snaps from under center this season. The group has shown out so far this spring. Junior Mark Walton, last season’s leading rusher who racked up 1,117 yards and 14 touchdowns on the ground, has performed well and even impressed the opposition over the weekend. Redshirt junior linebacker Darrion Owens said that Walton has really caught his eye this spring and that he has been impressed by all of the ball carriers up to this point. “Mark is a great running back and has really stepped up for us in practice,” Owens said. While the quarterback vacancy is certainly the biggest question mark facing the Canes heading into the fall, it was evident after this group’s first scrimmage that the other side of the ball has plenty of room to improve before the season begins. Sophomore linebacker and defensive leader Shaq Quarterman said he liked how the team performed as a unit on Saturday and that the younger players seemed to be fairly quick learners. 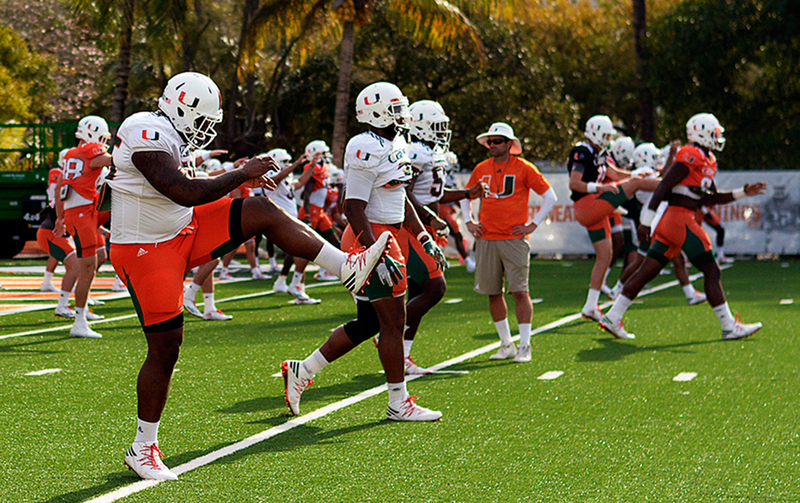 However, Quarterman also said he believes the defense would need to take some significant steps forward throughout the rest of the spring. Quarterman said that no particular defensive areas require the most focus – right now, every area is equally important.